Bridges and More takes the reader from the early years of Civil Engineering when Purdue’s campus consisted of a smattering of red brick buildings surrounded by grassy meadows and roads flanked by white, wooden fences to today’s state-of-the-art facilities such as the Bowen Laboratory for Large-Scale Civil Engineering Research and the online hub for the Network for Earthquake Engineering Simulation (NEES). 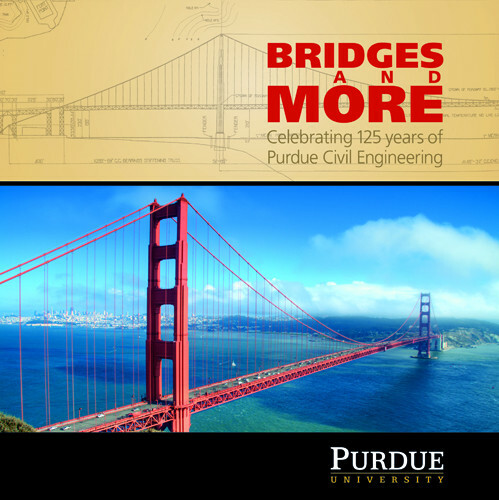 The highly illustrated book touches on major milestones in Purdue Civil Engineering history from Road School, to the Ross Summer Surveying Camp, to Purdue’s involvement in world landmarks such as the Panama Canal, Hoover Dam, the Golden Gate Bridge and the Tower of Pisa. Often, Purdue Civil Engineers are public servants, evolving research that helps to prevent disasters like building collapses and bridge failures. 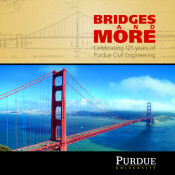 Bridges and More honors Purdue’s School of Civil Engineering with historic images and an appealing account of 125 years of education, research and a profession that is, as the title suggests, about so much more than bridges. Angie Klink writes biographies, histories, documentaries, children’s books, essays, and advertising copy. Klink was the scriptwriter for the 2013 documentary about public education, Rise Above the Mark, narrated by actor Peter Coyote. She is the author of Kirby’s Way: How Kirby and Caroline Risk Built their Company on Kitchen-Table Values (Purdue University Press, 2012), a spirited profile of one of the Midwest’s leading businessmen, his wife, and their company, the Kirby Risk Corporation. In her book Divided Paths, Common Ground: The Story of Mary Matthews and Lella Gaddis, Pioneering Purdue Women Who Introduced Science into the Home (Purdue University Press, 2011), Klink brings to life two remarkable female educators who improved the lives of American women. She also has authored the popular lift-the-flap children’s books Purdue Pete Finds His Hammer and I Found U. Klink is published in four titles for the Chicken Soup for the Soul series. She has won forty-four American Advertising Federation ADDY Awards and an honorable mention in the 2007 Erma Bombeck Writing Competition. She holds a BA from the Brian Lamb School of Communication at Purdue University.